Everyone thinks, we mice have a simple life here in town surrounding castle. Grain, cheese and other goodies everywhere and we are so tiny, that we slip and get everywhere. While this is all true, but no one realizes the dangers, that lurk everywhere. Big people are not our enemy, if you do not walk across the street and dodge between their stomping feet. Our mortal enemies are cats. And because this is castle, there are dozens of them. You can never be sure, that loose food is not just a trap. The most hungry is a cat called Timmy, who just ate my two sisters this morning. 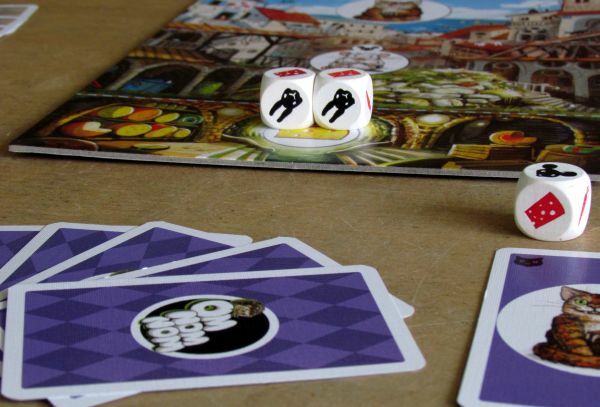 Om Nom Nom is interjection for chewing and at the same time it is also the name of the new board game from Brain Games, publishers of interesting air controller simulator Air King (review). This is new work of Meelis Looveer. 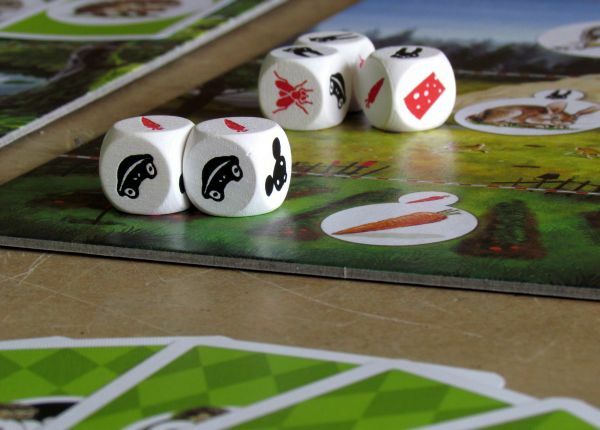 It is her second game after Food Chain (review) and he returns to the world of animals and whole food chain stuff. 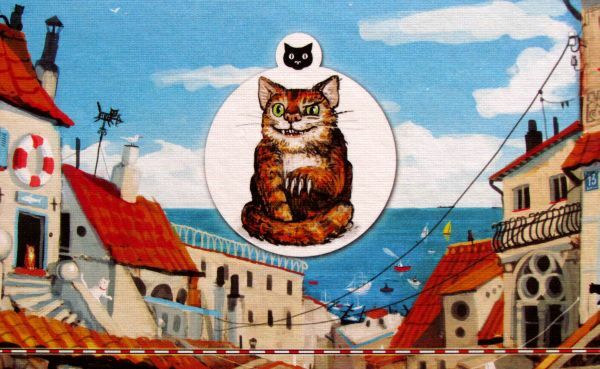 This time he was accompanied by illustrator Reinis Pētersons on her journey. 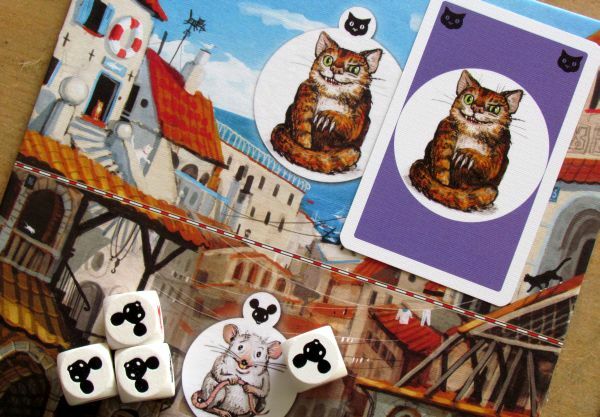 The game is a hot new product, that was recently introduced at the fair Spiel 2013 in Essen. 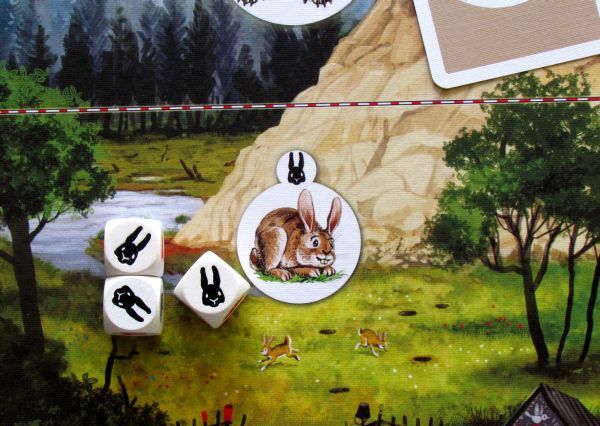 From small box last year (when reviewed all four of their games), creators moved higher up in the food chain, and this time present us a classical Carcassonne-like large box, that contains all important stuff for hunting animals. 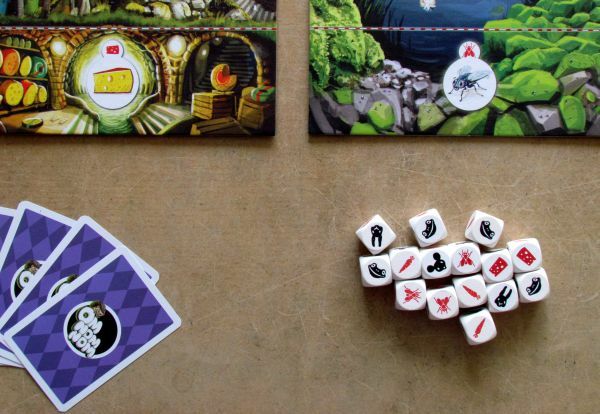 Inside the box with illustration of a lurking hedgehog, you find three game boards corresponding to the dimensions of the box itself. 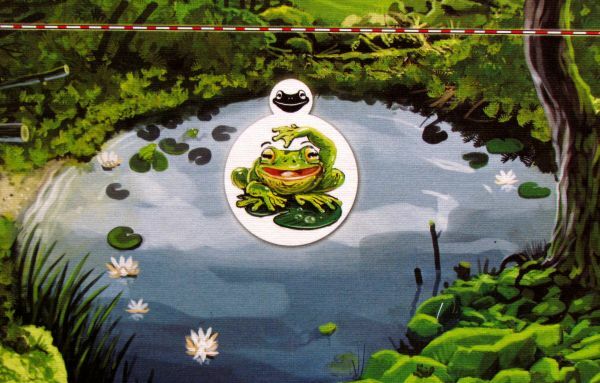 Each of them represents one environment – we will visit castle, pond and forest. 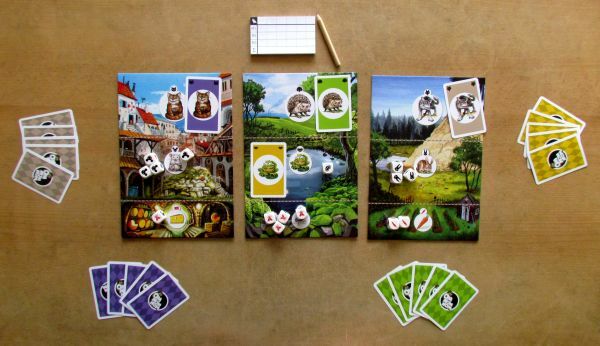 Each board is beautifully illustrated and divided into three floors, in which there are animals and their food. 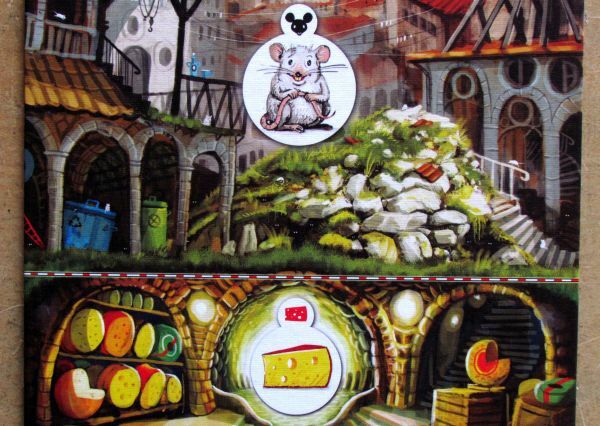 For example, in the cellars under the streets of the castle, there is cheese. Mice are running around the streets and everything is watched over from the roof by hungry cats. In this manner, each board is divided unequally into thirds and animal is drawn on each portion. That’s not all, because box contains six sets of cards in color for each player. 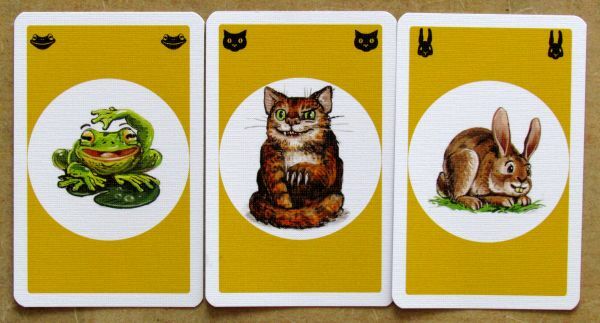 Each such deck contains exactly six cards with animals, that can be found on the board (third bottom row is devoted to food – cheese for mice, carrots for rabbits and flies for frogs). We have not mentioned only names of two predators – hedgehog and a wolf (third is the cat). Kit required to play is completed with pad and a pencil with six columns and four rows (three rounds plus total sum). And let’s not forget the fifteen dice, which are all the same. 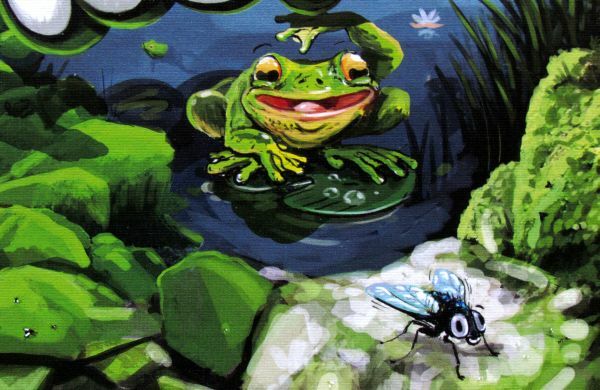 It includes a red picture of cheese, carrot and flies, but also black silhouettes of animals in the food chain above them – a mouse, a rabbit and a frog. Their color indicates a point value, that it will bring you – two points for red, while black is worth only one point. At the same time it also expresses the risks, they could be eaten, when hunting prey. Predators have nothing to be afraid of, but the smaller creatures do. And that’s what we do now, when we show our teeth and get into action. 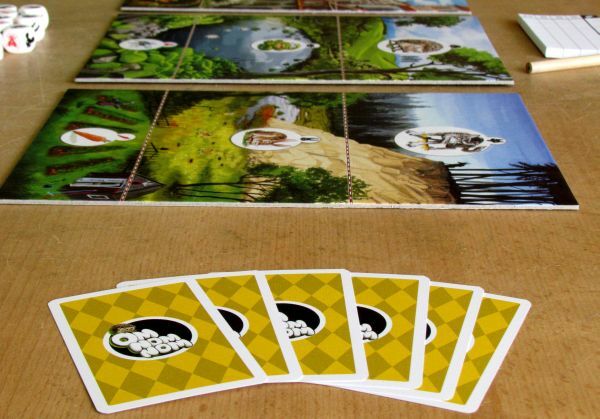 Three boards are placed in the center of the table at the beginning of the game, and each player takes one set of six cards. After all of them are played, you will know, one of the three laps was completed. It is still necessary to entitle your initials in pad and lay aside a group of dice. Now everything is ready for the first food chain fight. And it will be a really good fight. Prey available will be revealed by very first roll of the dice, in which players can split rolling the dice among themselves or may leave the entire task on one of the rivals. 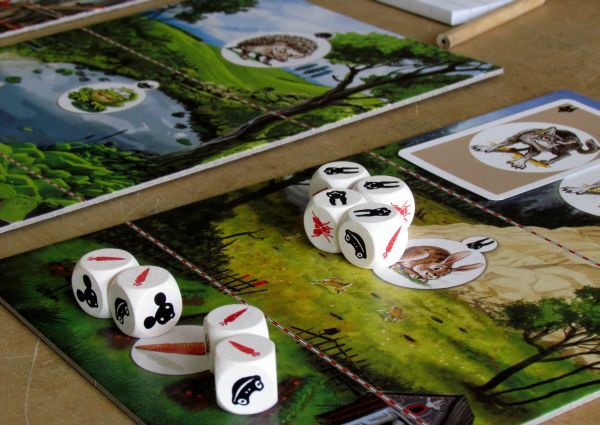 Then you need to divide the dice according to symbol rolled into boxes with corresponding animal and food. This creates food menu for the current round. 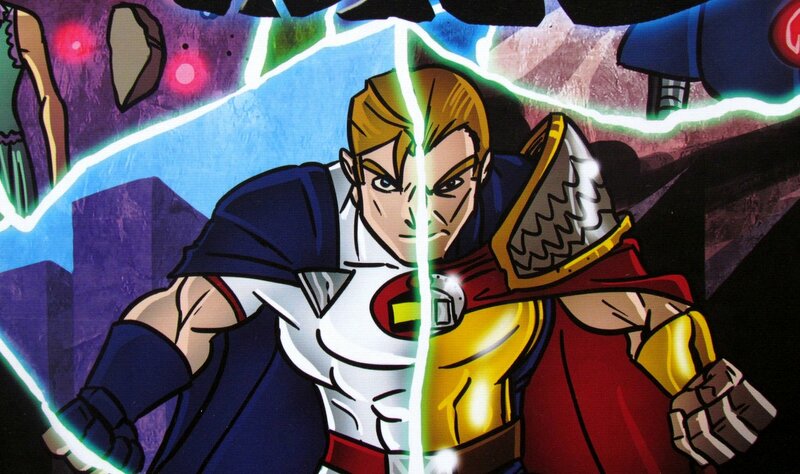 But even in the next stage of the game, players will not alternate in turns. All secretly chooses one card from six in hand and places it in front of them. They are trying to eat the most valuable food on the board, but must also keep in mind, that others can go after the same prey. But easy prey is not only due to dice, but even played cards can become one. 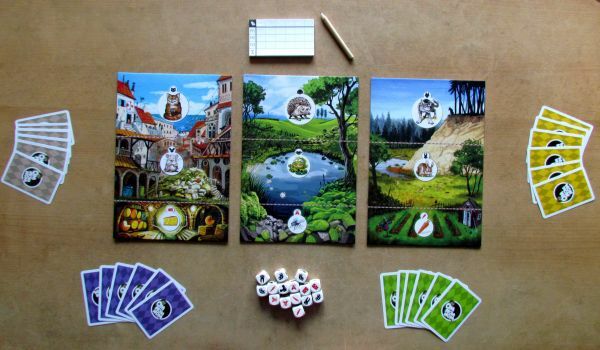 After revealing their choices, players add their card on the board and only then can follow evaluation of the entire turn. You must always play a card, that is a level above your prey on the food chain. 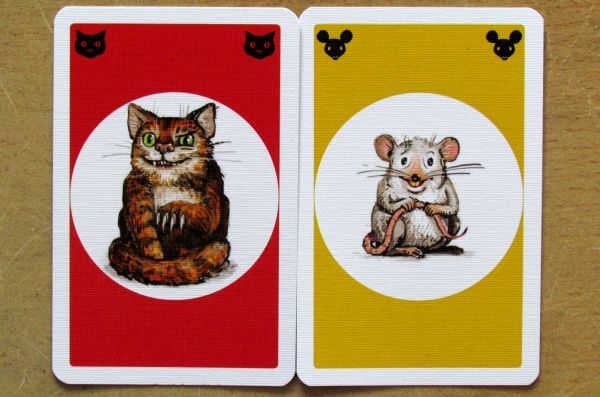 To eat cheese, you must play a mouse, while to capture the mouse, you must reveal a cat. 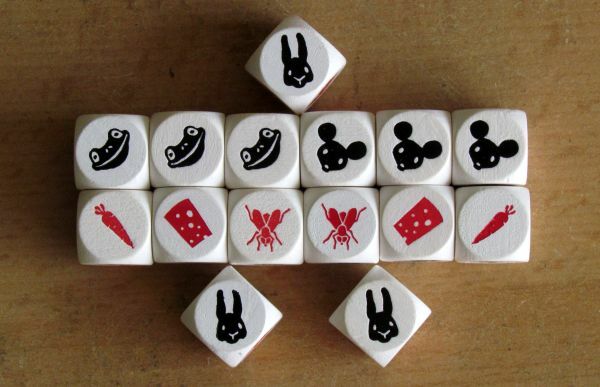 Values of individual food lying on the board in the form of dice (and cards) is easy to navigate in – each dice with a black symbol means one point, while red is two. Whenever you visit some places alone, you may find yourself in paradise with plenty of food. Get all the dice and that’s it. But often there is a match, when two or more candidates must fight for common prey. In this case, catch is divided equally. What is impossible to split runs away, so if three cats pounce on two mice, mice run away and no one gets anything. But a rabbit’s for carrot may also be unsuccessful, because the wolf could be hiding in the backyard. 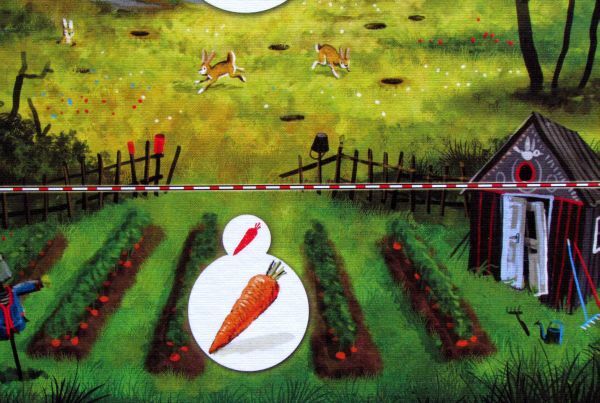 A food chain is evaluated always from the top down, so that when wolf eats the rabbit, he had no chance to feast on carrot. 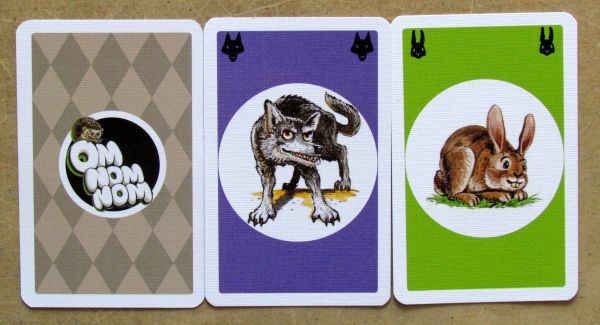 Players choose one card at a time from their hand to the point, where they have no longer left with any. Prey is shrinking during the round as well as cards and is harder to grab on to it. 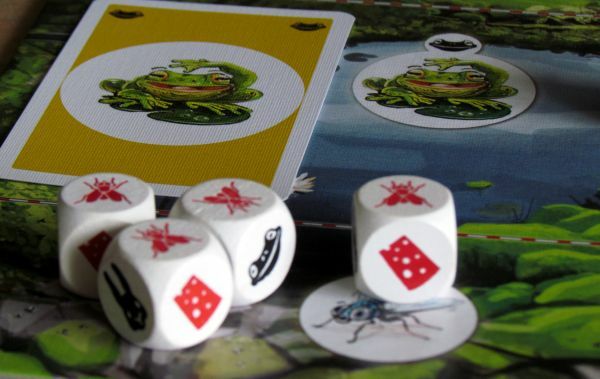 At the end of the round, counting points follows, which includes not only eaten dice, but the opponent’s cards as well. These can be just as good food for one of the above constructed predators and also valuable point addition to you. 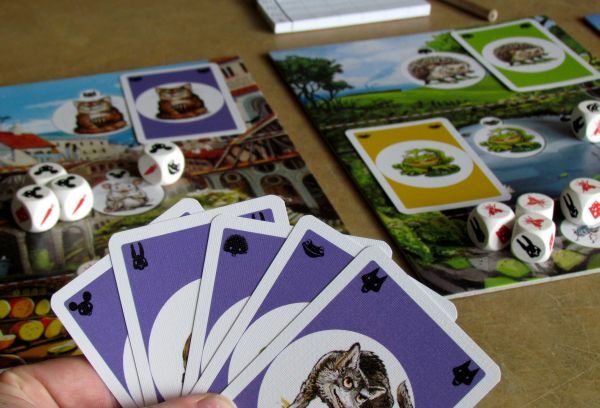 You then write the sum to a note pad, players take their cards back, reroll the fifteen dice to form a new random selection and the game can continue to the second round. After playing on the third day of the battle for food, are score gains all added up and the highest value points to the winner. 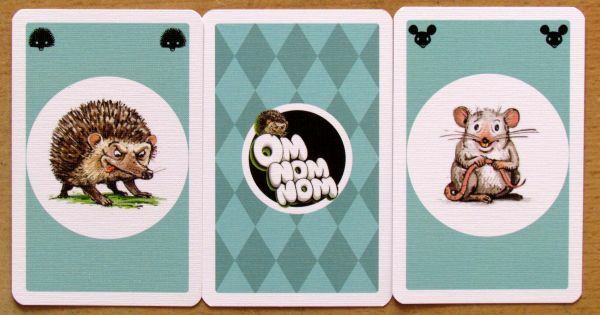 Om Nom Nom is a simple card-dice game, in which you try to guess the intentions of your opponents, be first to catch a prey and eat each others cards. Similar games recently emerged in numbers (eg Czech Malacca – review or Ciao Ciao – review), but this one has really a beautiful processing. In addition, the theme of the food chain is really nicely selected and works very well. 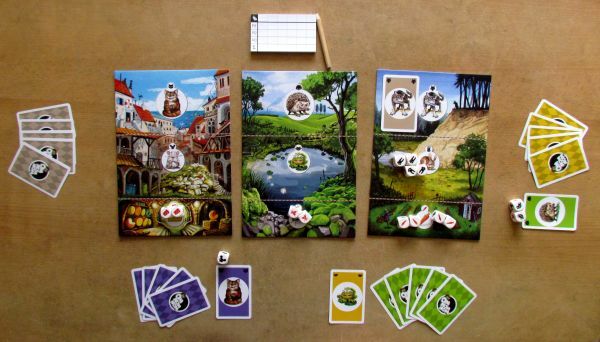 The gameplay is similar to a card game 6 nimmt, but without the nice topic . Most importantly, however, is the actual mechanism, where all participants must weigh their decisions well. 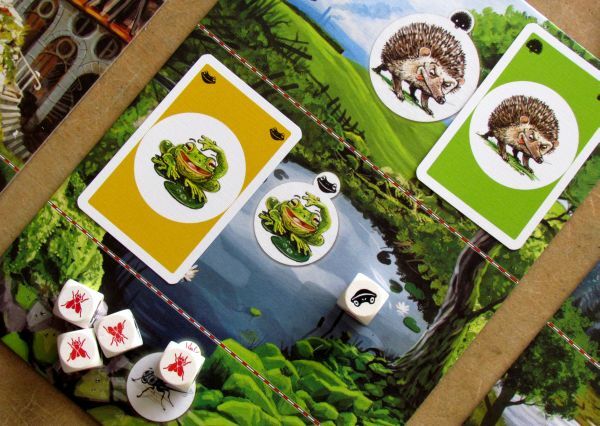 Will you go with a frog after much valuable loot and risk, that your opponent plays a hedgehog and eats you, before you can get anything? For success in the game, it is important to carefully track, which player has already used which cards. You can then better assess, where is the most secure place on the board. Sometimes, it is better to settle for smaller prey, but sometimes it is necessary to relentlessly fight for the biggest catch of the day. It depends on how the situation evolves and how you evaluate it. The game is really fast and players are constantly involved in its course. There are no moments, where rivals are waiting for each other. Thanks to this, time really flies by, when playing Om Nom Nom and you have no problems to finish the whole game within twenty minutes. There is too much space on the board in two players and you do not feel such pressure on decision-making. It would be better to exclude some areas from the game and dice with that result would be simply rolled again or discarded. This increases the chances, that players meet in the selection of prey. However with more opponents, the situation starts to get really exciting. 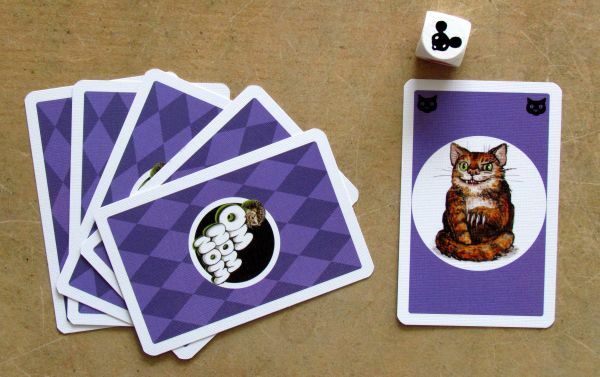 Game also offers a version for solitaire play, which of course depends solely and purely on luck. The big advantage of course is simplicity of the rules, which makes this game accessible to everyone. Game board helps you to keep track of how the situation looks like and it is not difficult to calculate, which location is the best for you. Dividing the spoils is well done and described in detail in the rules, so you will not doubt even for a moment. Now we must really praise the rulebook, because it does not raise a single question. And this is new in Brain Games. It is obvious, that they learned from last year’s experience in this. 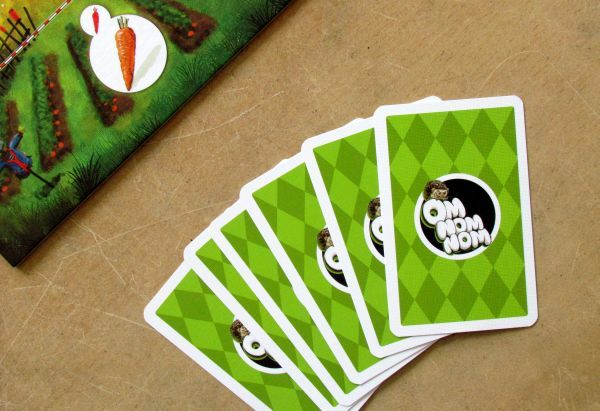 Om Nom Nom wins your love with first glance on beautifully illustrated game boards and minutes later also with simple gameplay, which has no trouble entertaining you. It does not bring any innovative mechanism, but all it does, does well. And that means, it is really nice family game, especially children will love. When you drift along with the simple gameplay of this game, only satisfied “om nom nom” can be heard coming from the table. 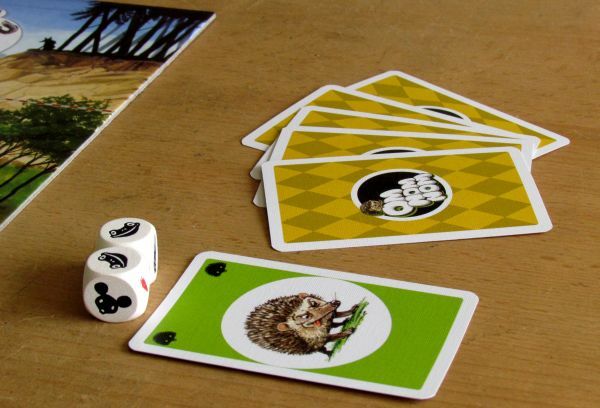 Om Nom No mis a dice hunting game, in which you are trying to gather more prey, than other players. Its not simple to choose only one spot each round, where you will be hunting. Who will you become this time? Mouse, wolf, hedgehog or some other animal? 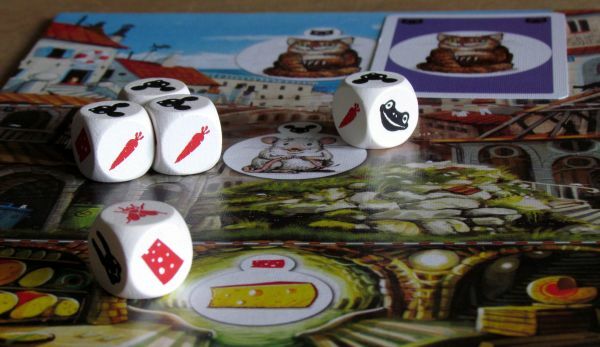 You are tempted by smelly cheese, carrot and many other tasty goodness, which are randomly scattered on the board based on one dice roll. But in a moment, when several predators is hunting the same food, fight starts. So you are trying to guess others intentions and go to other place, which is at the same time interesting for you. In a moment, when two predators meet, they share prey at halves, but any remainder is lost. Game looks beautiful and is really quick. 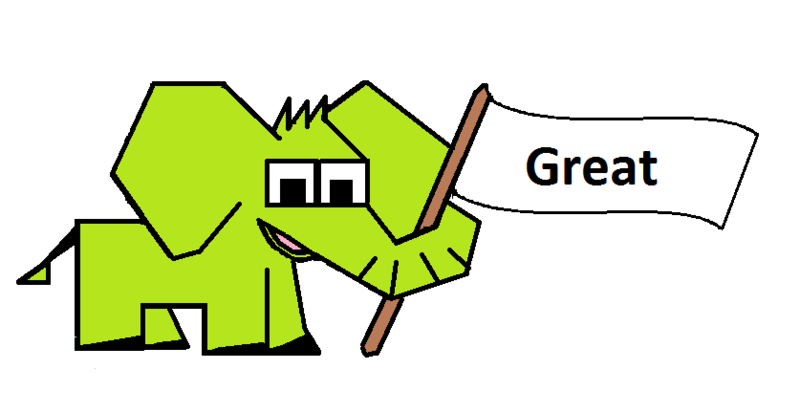 This belongs to its main advantages, together with really easy rules and attractivity for kids. 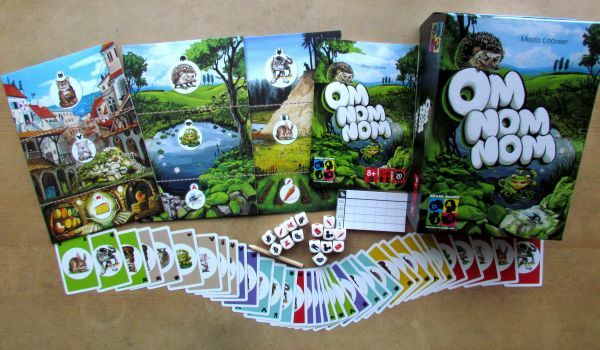 Om Nom Nom is really nice family game.